My interest in coracles was first kindled at the tender age of eight after seeing a picture of a Celt carrying a coracle on his back in a school history book. It was quite some time later however when I first attempted to construct a coracle during my formative wilderness survival years. 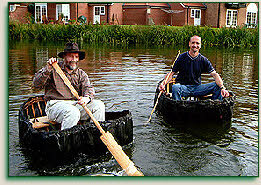 The first efforts were very primitive ‘plastic bag’ coracles that were more Heath Robinson than Robinson Crusoe. These make me cringe and laugh in equal measure to this day. These later improved with slightly better versions covered in animal hides that were still quite rough and unstable. 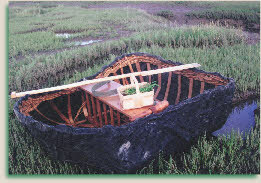 It wasn’t until the mid 1990s that I began to research the craft coracles of the salmon and sewin, (sea trout) coracle netsmen of West Wales whose art I have the deepest respect for. 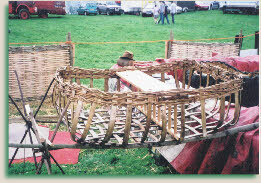 This period brought me into contact with Ronnie Davies, (sadly deceased, December 2010), of Cenarth who was one of only two ancestral coracle makers not only the Afon Teifi but anywhere who were still framing coracles by what I would regard as genuinely traditional craft methods. The other traditional ancestral coracle craftsman who is still with us at the time of writing is Bernard Thomas of Llechryd. Perhaps to atone for my past Heath Robinson sins and because of its stability and authentic rustic charm, I was immediately drawn to the cleft (split) lath and woven withy Teifi coracle. To me this was ‘proper’ coracle making that represented the ultimate combination of skilled craft and functionality in a coracle. The Teifi coracle was also unique in being the only remaining ancestral coracle type that hadn’t given way to the faster, cheaper and less skilled manufacture of coracles from sawn laths, nails and staples, particularly outside of Wales. Indeed, skilled cleft lath coracle making is sadly under serious threat of extinction whilst the more modern methods become more common, especially on coracle making courses. Some of my first cleft lath coracles were involved in charity expeditions such as the 1998 source to sea coracle paddle on a dangerously swollen Afon Teifi in aid of the Imperial Cancer Research fund and later on a similar though far less dangerous paddle the length of the River Witham in Lincolnshire. From the late 1990s until recently, I also crafted traditional Teifi coracles as well as my own cleft lath Witham Coracle commercially. 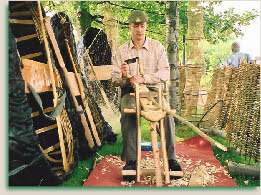 I also demonstrated coracle making and woodcrafts at country shows and other public events. Sadly, despite my enthusiasm and the quality of what I was making, the coracle making never paid what it should have done given the effort and skill I was putting in, something I attribute to the throwaway society we live in and the ever greater availability of cheaper alternatives. Rather than feeling that I was selling myself and my craft short by using the same methods as the competition, I got out. Today, I continue to craft fine cleft wood and withy fishing coracles on my own terms in memory of Ronnie Davies who helped and inspired me so much. These boats continue to see extensive use in working applications such as setting eel grigs, lines, nets and angling as well as use in bushcraft and nature observation by myself and others. Recently I have also returned to hazel and hide coracle and curragh building which whilst making poorer working coracles due to their weight especially, still look nice and are considerably easier to build whilst still being ‘authentic’. As I am a strong advocate for the continuation of traditional coracle making, especially in Wales, I will always endeavour to put those interested in purchasing a coracle in contact with craftspeople who are, in my opinion, employing genuinely traditional methods. They will need all the support they can get.